It's back! The lounge is pleased to bring back the Beers of Myths and Legends review.We will be posting the original reviews with their review dates. We also look forward to new reviews of beers with themes of myths or legends. Check back with us to see how the updates are going. Violin Monster is a tribute to the legend of the werewolf beast finding contentment while playing his violin during the blood red harvest moon. Pours midnight black with a crisp aroma of autumn leaves. The mouthfeel is silky, creamy smooth. This complex beer has the typical notes of a chocolate/coffee stout, yet subtle. The ending has the subtle flavors of fall spices. Best enjoyed at cellar temperature, and should age well if stored. A favorite from Sierra Nevada, Narwhal imperial stout is as dark as the Arctic Ocean depths. The molasses colored, thick stout has a scent of bakers chocolate. There are a variety of flavors that your taste buds experience, like bittersweet dark chocolate, black licorice, alcohol, and molasses. It has a malty richness that will leave you wanting more. This beer may mature well at cellar temperature. From the Legend of Sleepy Hollow comes a tribute to the old schoolmaster, Ichabod Crane. Don't be afraid to try this pumpkin flavored ale. Tastes like a pumpkin pie with a beer chaser. With its hints of nutmeg and cinnamon, and festive amber color its sure to bring joy to your taste buds this Halloween season. Great Lakes Brewing tributes both the legend of Dracula, and the legendary silent film. Nosferatu (the beer) is a blood red color with a smooth malty feel backed up with a rich hop flavor that has only the slightest bite. This one is so well balanced with flavor, you can enjoy it well chilled, or near room temperature. Grab a brew, turn down the lights, and watch the movie! Pours a nice caramel color with a red tint. A nice smooth malty-caramelly slightly complex character. A variety of mellow, berry like tastes that are slightly sweet. Nothing at all what you would expect from such a beastly looking namesake. I might suggest it will tame your inner beast. A special brew I look forward to every year since my first "sighting" back in 2008. 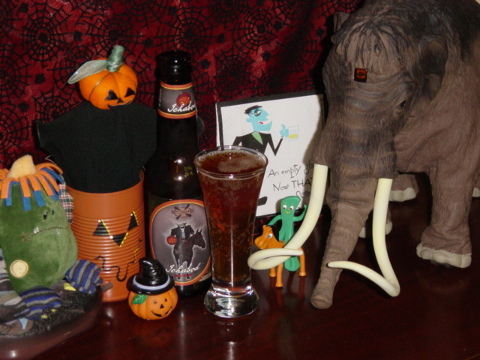 Bigfoot ale has a great reddish brown color and a rich creamy head that holds on to the glass all the way down. Bigfoot has a well balanced flavor of caramelly malts, fruity hops, and a bit of alcohol presence. The complex flavors change through your enjoyment from the first sip to the last. With its thick creamy head clinging to the glass while floating atop the reddish, copper color liquid goodness, this beer is one you are sure to enjoy. It is very malty and caramelly with a light hop flavor and a slightly sweet ending. The abundance of flavors you will experience change as the beer warms to room temp. Old Guardian is a fitting and worthy tribute to the mythical creatures of the night. This beer may mature well at cellar temperature.